I’ve been making so many sweets lately that I had to take a bit of a break and allow the leftovers to be eaten before making more. 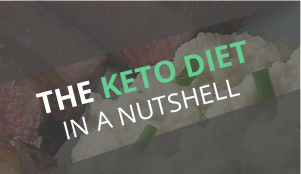 Being on a keto diet, it’s hard for me to keep eating sweets, even if they are low carb, because I find my cravings start to come back after I eat them. Low and behold, everything is gone and I wanted to make something I haven’t done in a while. I settled on brownies because I haven’t really gotten around to making a cake, and I have only been making cookies lately. The brownies turned out a little fudge-like, as I wanted. They’re a bit light in consistency, but melt in your mouth and become rich and almost dense. My only suggestion to make them a bit better is to chop up the Macadamia nuts into smaller pieces. I halved all mine, which was easy to do, but I wish I would have made the pieces smaller, so they were in every bite. I have been experimenting with salted butter in baking and I must say that I really like it. 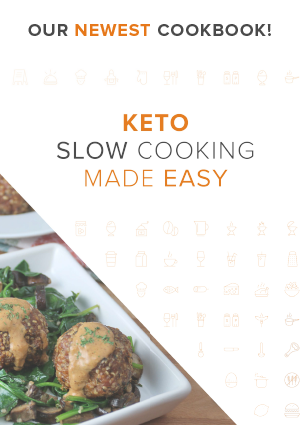 You don’t have to play a guessing game on how much salt you should be adding, or be worried about your kosher salt properly disintegrating into the batter. The salted butter adds just enough salt to bring out the sweet flavors, and makes it easier for you in the long run. Why the macadamia nuts? 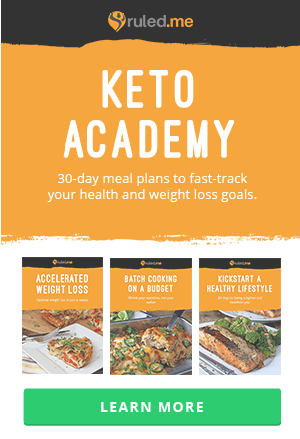 Well they are packed with omega 3’s, have a great amount of monounsaturated fats, are an awesome source of complete amino acid proteins, and heck – they even taste good! 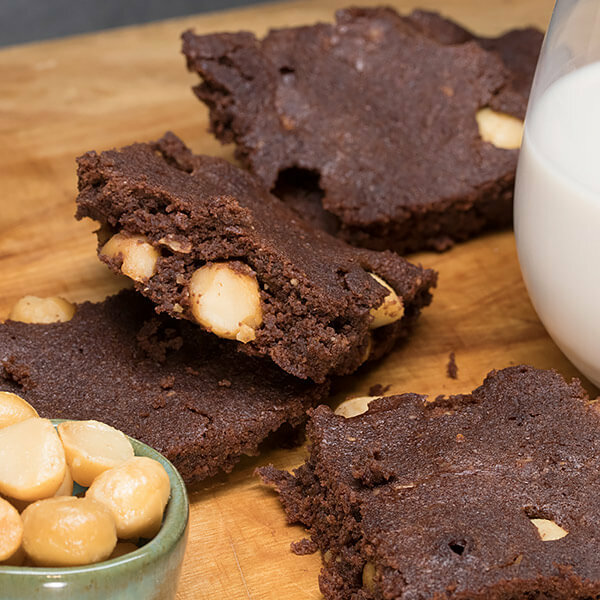 They’re pretty fantastic, health wise, so I decided to use them in the brownies. 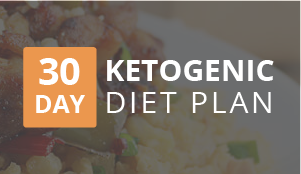 They have some carbs, yes, but I see them as being worth it overall. I normally order my Macadamia Nuts online because it’s the best price I can get. 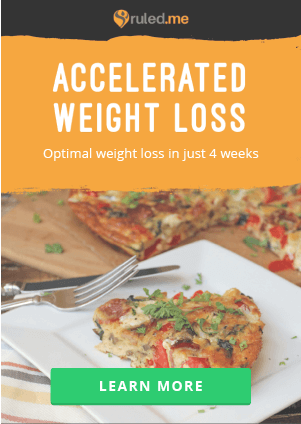 If you’ve been wanting to get away from the old fat bombs made of butter and cream cheese, these will do the trick! 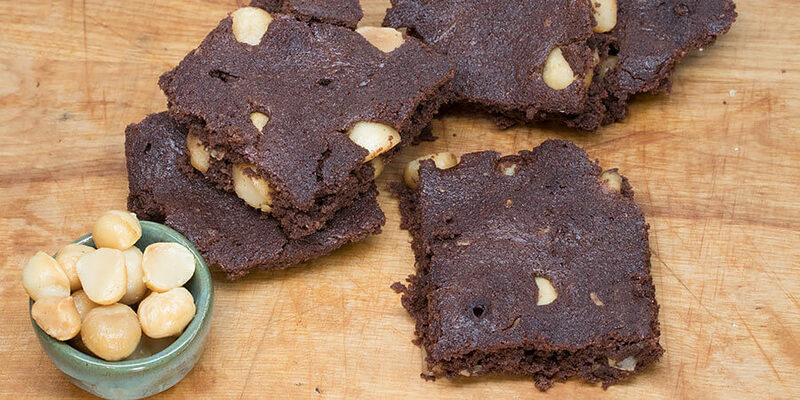 And if you’re a lover of macadamias then you’re in for a treat. If you don’t like macadamia nuts, try subbing them out for walnuts. Walnuts are also loaded with omega 3’s, and great for you. 1. Preheat your oven to 350°F. 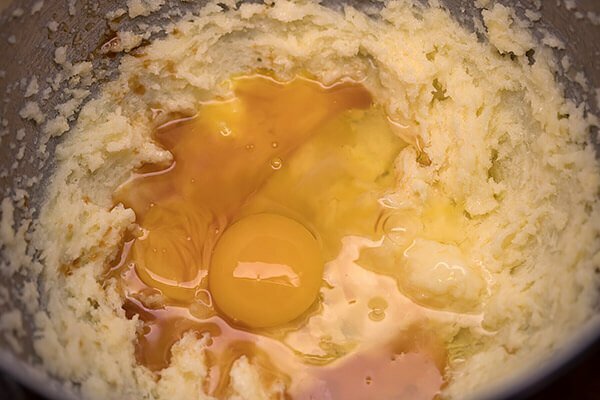 If you can, before you start, have your butter and eggs waiting at room temperature. 2. 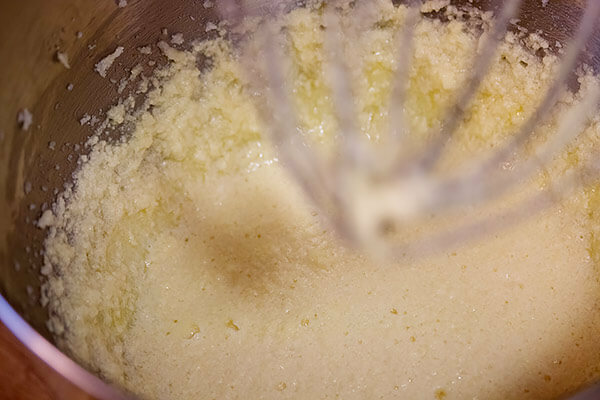 In a mixing bowl, add your butter, coconut oil, and erythritol. Let the butter get to room temperature before you start mixing it up. 3. 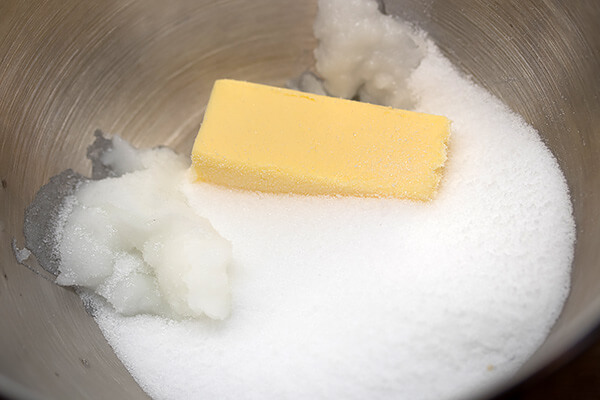 Cream the fats and sweetener together, making a creamy consistency. 4. 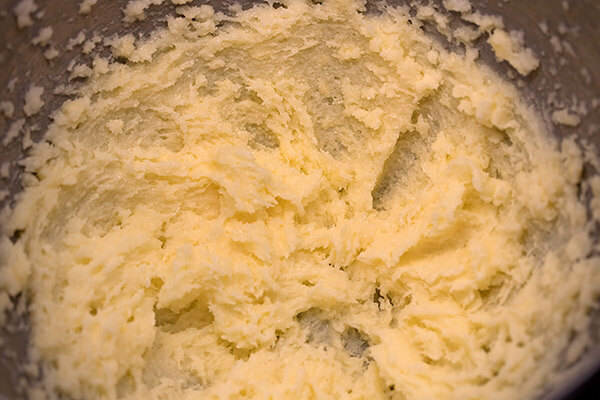 Add your eggs and vanilla extract into the creamed butter. Try to have the eggs at room temperature before you start. 5. 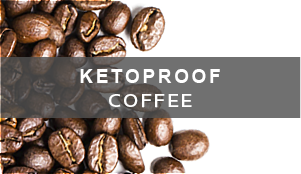 Mix these together well until everything is a creamed consistency. If you didn’t use room temperature eggs, like me, your coconut oil will seize up a bit and create a lumpy texture. 6. Add your cocoa powder and instant coffee to the mixture. 7. 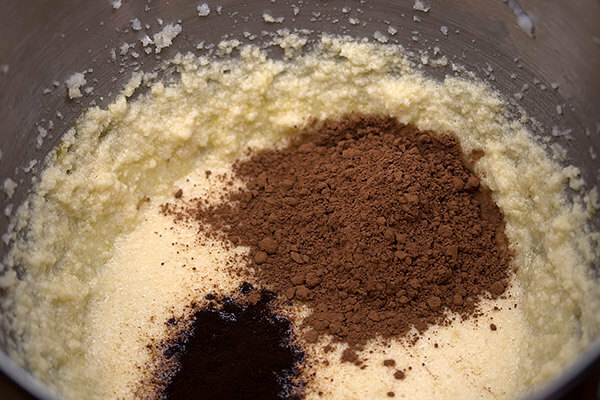 Mix the cocoa powder and coffee in well, until the mixture is a dark brown. You can now add your baking powder. 8. Cream everything together and then add your almond flour. 9. 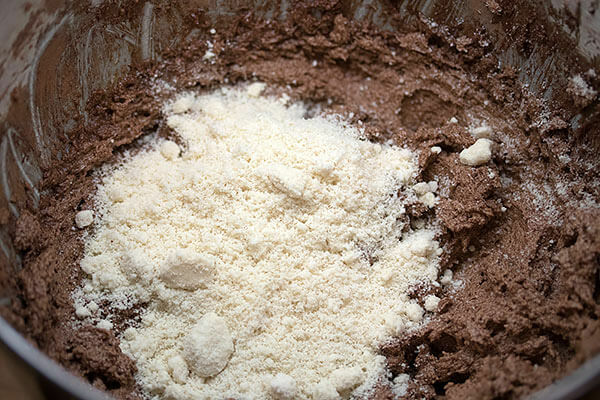 Mix this thoroughly until a light brown and fluffy texture is achieved. 10. 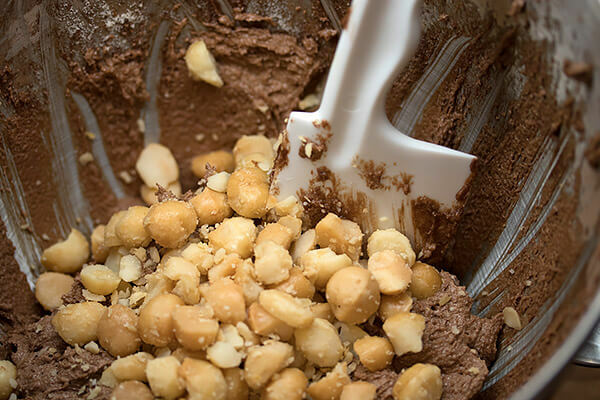 Add 1/2 Cup of your Macadamia nuts and fold them in, making sure they are evenly distributed in the batter. 11. On an 8×8 baking sheet (I used 9 x 9 1/2) spread your batter evenly. 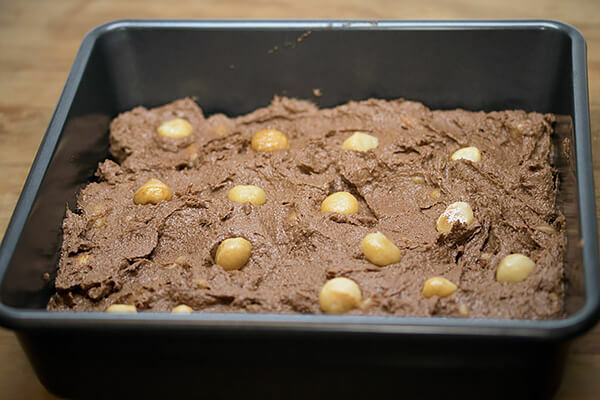 Top with the rest of your macadamia nuts, and press them into the batter with your finger. You want them to be submerged into the batter, but still showing the top. 12. Put your brownie batter into the oven for 25 minutes at 350F. You should be able to poke them with a toothpick and have it come out clean. The edges will be slightly brown, almost burnt. 13. 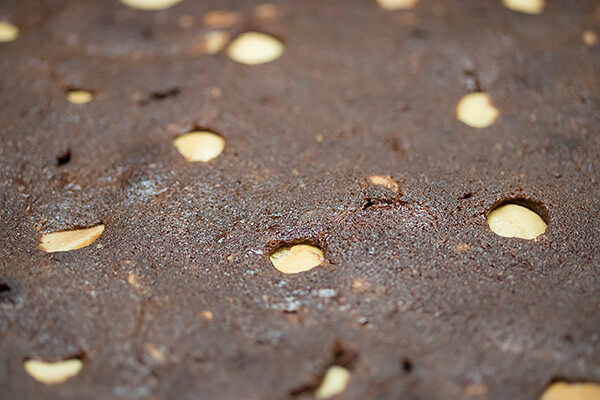 Let them cool for at least 15 minutes, slice into thirds horizontally and vertically (making 9 total brownies). Serve them up and enjoy! 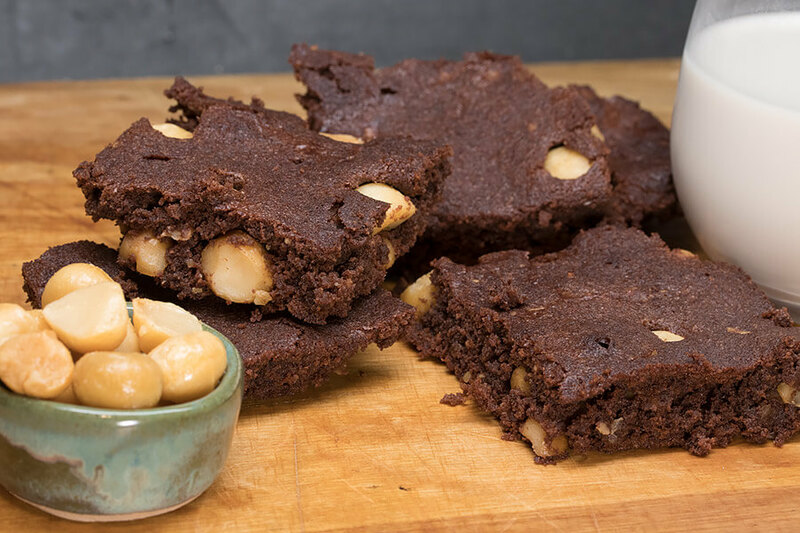 This makes a total of 9 servings of Low Carb Macadamia Nut Brownies. 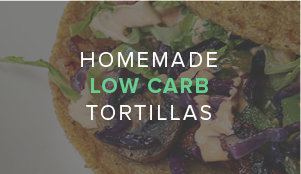 Each serving comes out to be 266.33 Calories, 26.83g Fats, 2.41g Net Carbs, and 4.71g Protein. Cream butter, erythritol, and coconut oil together. Cream 2 eggs into the butter mixture. 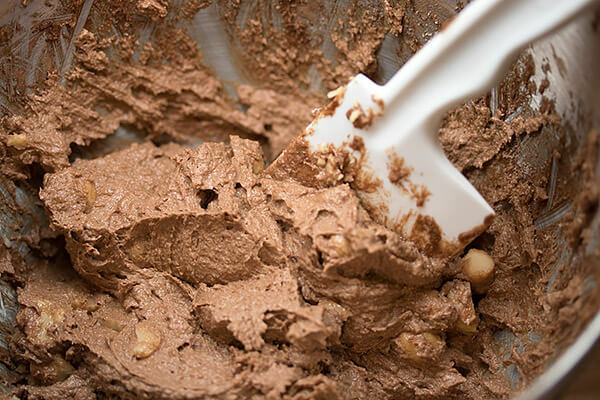 Add your cocoa, instant coffee, baking powder, vanilla extract, and almond flour slowly, mixing it in thoroughly.